Whenever the question of a first look comes up, we are almost always met with an excited bride and confused groom. It's no fault of the groom that he doesn't know what this wedding trend is. We generally give the bride the chance to explain it, if she is familiar. But it's still kind of difficult to find the right words to describe it. When we explain it, we want to be informative and still give all the sweetness that is involved. The benefits and trade offs are not always immediately obvious. It takes both people to decide if a first look is right for them. Having to find the right words to make a confident choice is a challenge. We want to give you the resources that allow you both to be at peace with your options. 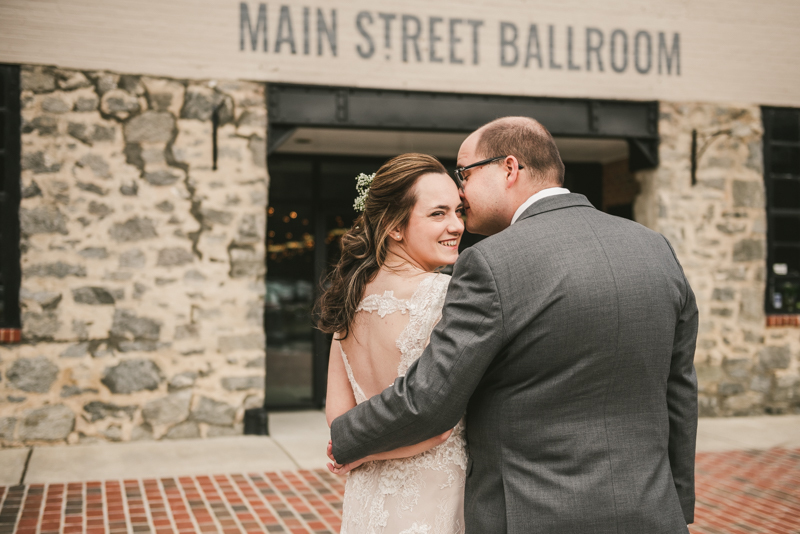 So we are excited to give you the information about a first look, and the tools to know if it should be a part of your wedding day. The easiest way to explain a first look is that it's a chance for the couple to be with each other before all of the craziness starts. It's an intimate moment that you two get the chance to share on a day that is all about your love. A first look is never rushed or forced. It's honestly the most exciting time during the wedding, besides the declaration of marriage. 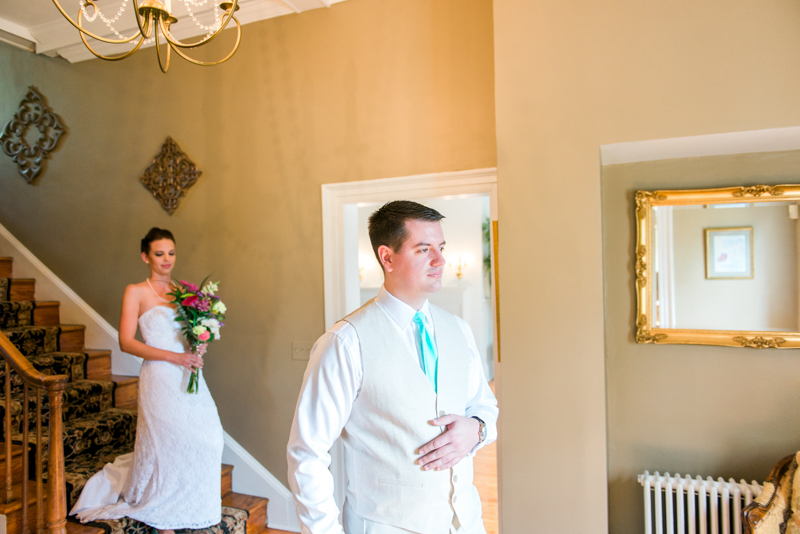 The process of this romantic event starts with the groom anxiously facing away from his bride. The bride approaches her love in a slow and steady manner while building suspense. During this time, the groom is feeling the peak of his giddiness as he hears the grass or carpet swish against his bride's dress. As she reaches her man, she brings her hand to his shoulder and gives him a gentle tap. He turns around with an excited sigh and let's an "Oh my God" escape his mouth. Taking in his soon-to-be-bride's beauty, he has to take a step back in order to let it sink in that this is the beginning of his forever. What are the benefits of a first look? The best way to knock out your wedding jitters is with each other: chatting, laughing, and hugging. If you have the opportunity to do those things, you will not be sorry. The most intense amount of nerves happen right before the ceremony. You start pacing, worrying about your legs working, and not to mention being concerned if you face plant. A lot of those feelings cease when you have the chance to be with each other before all of the major excitement starts. Another benefit is that you both are feeling fresh. 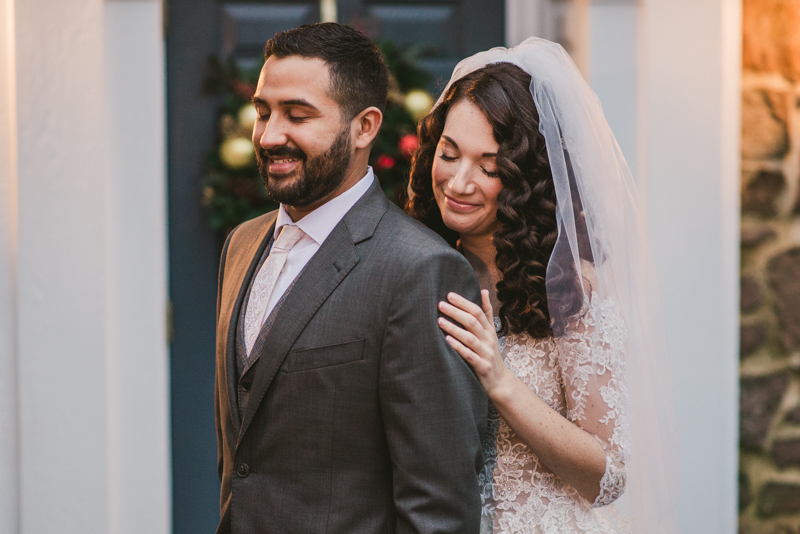 The bride has flawless makeup, the groom's hair is neatly done, and everything is perfect. You two get the chance to be totally super model worthy. After the ceremony - depending on the temperature, elements, and amount of tears - some of the expert work done by the hair and make-up artist may have slightly changed. Finally, there is a pragmatic benefit with timing. After first looks, we usually take some time for bridal portraits with the two of you. It is a great opportunity to have the photo taking offloaded before the ceremony. Again, this is the best time for your hair, makeup, and style. It might also be a better time if there is a chance your ceremony will push later into the evening when the sun might be setting. Should we be doing one? Only you two can really answer this one. We never like telling a couple what they should do, because it's not our day. While we direct some things on the wedding day, the big decisions get left up to you two. What I can say from experience is that some weddings benefit greatly from a first look. If your ceremony will be taking place 30 minutes before sunset, your bridal, family groups, and portraits will be greatly affected. Knowing the benefits above, consider if it's something you two would be able to enjoy. Most importantly, discuss the possibility together and reach an agreement. First looks are amazing, and might be a perfect addition to your big day. One final note: there is an alternative to a first look we can recommend that we call a "first touch." 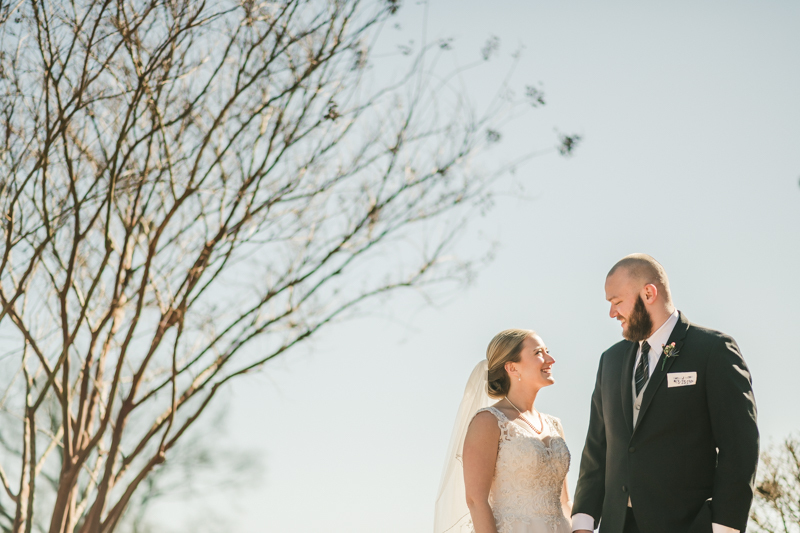 We have discussed the first touch before, and think it's great for a couple considering a first look, but wants to keep the surprise of walking down the aisle. 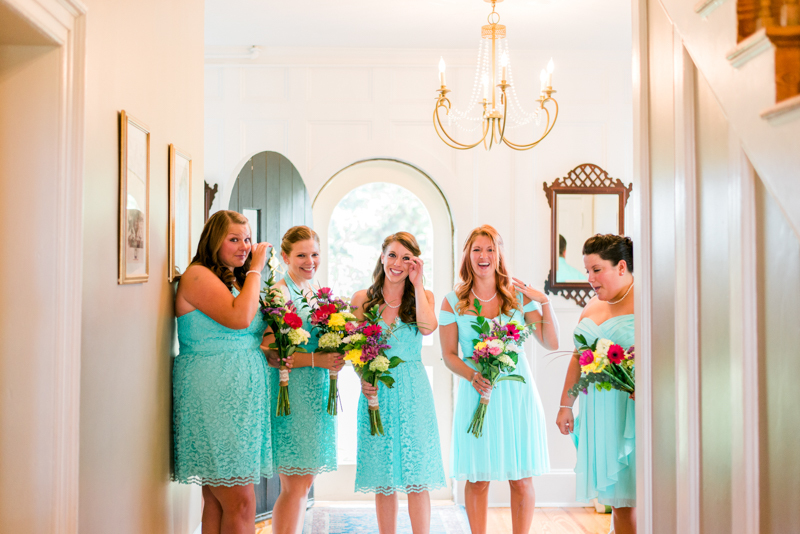 It is a wonderful and memorable opportunity for a private moment together that can reduce some pre-ceremony jitters. It is a different experience, but is worth adding to the conversation.